Most people easily recognize that a physical illness or disability may require a reasonable accommodation under the Americans with Disabilities Act or time off under the Family and Medical Leave Act. But mental disabilities are covered by the ADA and FMLA, too. With 1 in 5 adults experiencing a mental health impairment in any given year and 1 in 25 persons living with a serious mental health impairment, according to MentalHealth.gov, chances are that an employer at some point will have an employee with mental health concerns. That makes being ADA and FMLA compliant paramount. Here are eight steps to create a good mental health work environment for employees, while at the same time maintaining compliant policies and practices. 1. Recognize when FMLA leave or an ADA reasonable accommodation is needed. In the best situation, an employee will self-identify a need to take FMLA leave or ask for a reasonable accommodation under the ADA. However, they often will not use those terms. If an employee provides the minimum required information to alert the employer that a condition exists that may constitute a serious health condition (FMLA) or disability (ADA), HR should be contacted so it can determine if the employee qualifies for FMLA or ADA coverage. 2. Train supervisors to be aware of the signs of mental health disorders. 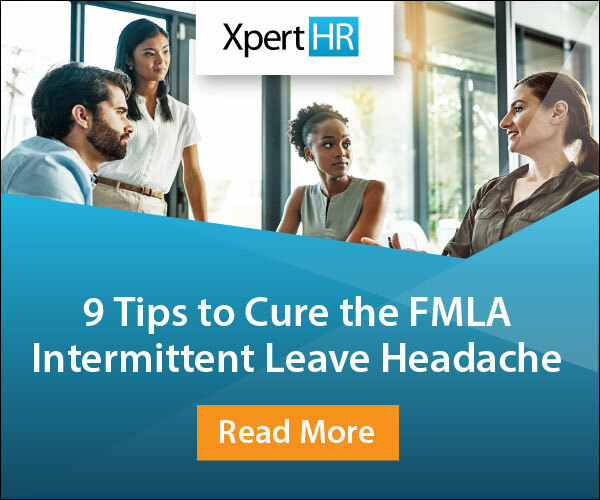 When viewed with other signs of mental impairment – such as a persistent depressed mood, decreased energy and focus, or being more emotional – these behaviors may indicate the need for FMLA leave and/or a reasonable accommodation to enable the employee to perform the essential functions of his or her job. 3. But leave the medical diagnoses to the medical professionals. An employer should not attempt to diagnose the medical issues of its employees. Unless raised by the employee, a discussion should not include anything about mental impairment. If the employee brings up the mental health issues, the employer may instead provide information on an EAP. If a disciplinary situation is involved, employers should consider whether or not an employee’s mental disability is a contributory factor to the behavior or performance, and whether a reasonable accommodation is needed or a current accommodation is sufficient. 4. Begin engaging with the employee immediately. The interactive process should begin immediately once the employer has knowledge of an individual’s disability and that the disability is impacting the employee’s ability to perform his or her job. It is important to document the interactive process. 5. Be open and flexible in considering various reasonable accommodations. A reasonable accommodation need not be expensive or burdensome to be effective. For example, Bob a recently returned vet, became agitated and angry when approached or startled from behind. His workspace was in the middle of the workroom, with other desks all around. The employer relocated Bob’s desk to the back of the workroom so that he could not be startled by someone approaching from behind. Other things employers can consider include removing nonessential job functions, arranging a flexible schedule, or offering FMLA or additional ADA leave. Many tips and suggestions can be found online. Whatever the accommodation, it needs to be effective in helping the employee perform the essential functions of his or her job. 6. Use management techniques that support an inclusive workplace. Provide sensitivity training to coworkers and supervisors. An employer should exercise extreme caution with employees’ confidential medical information, especially mental health information. Medical records must be kept separate from the employees’ personnel files. Only HR should be given access to these records and only when there is a need to know. An employee is free to share information about his or her condition with coworkers, but it is safest for an employer not tell anything to the employee’s coworkers and supervisors. 8. Take necessary steps if an employee poses a direct threat to himself or others. An employer must provide FMLA and ADA accommodations to employees with a serious health condition or disability, but the laws do not require an employer to risk the safety of the employee or others. If an employer determines that an employee is a direct threat and there is no reasonable accommodation that would safely alleviate the threat, the employer can decide to terminate the employment. In such cases, the employee’s records should reflect that the employee was “administratively” terminated; in other words, that the employee was terminated for reasons that were not his or her fault. What tips or suggestions have you found effective for remaining compliant with the ADA and FMLA when handling employees’ mental health issues? Let us know by leaving a comment below.